MARINKA, Ukraine -- Ukraine and pro-Russian rebels on Saturday exchanged nine prisoners captured in the country's war-torn east in the first such swap this year, an AFP journalist witnessed. 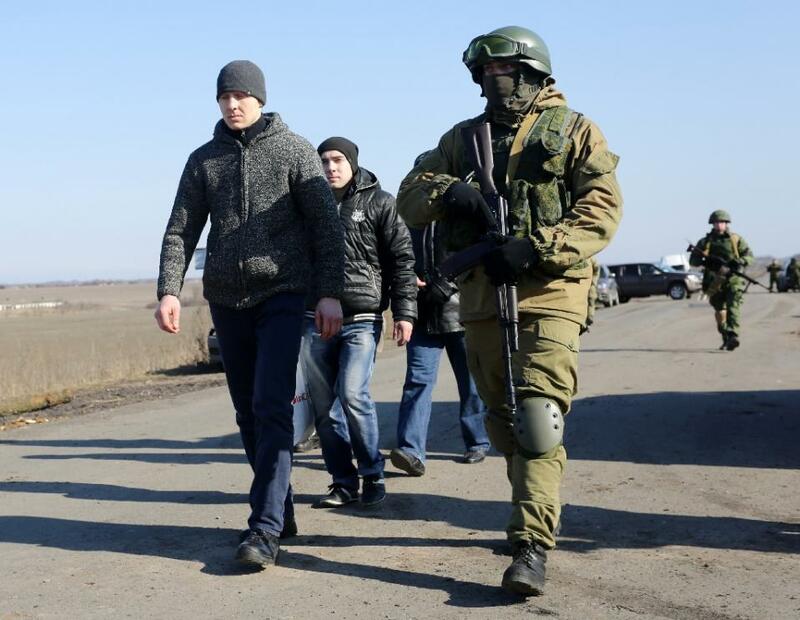 Pro-Russian rebels (who look more like Russian soldiers) carry out a Ukrainian prisoner exchange in near Marinka village, in the war-torn Donetsk region on February 20, 2016. The swap between the Kiev army and the self-proclaimed Donetsk People's Republic (DPR) took place at mid-day on a road through fields close to the town of Marinka, some 20 kilometres (12 miles) southwest of the rebels' de facto capital Donetsk. The pro-Russian eastern militia handed over three Ukrainian soldiers and the Ukrainian forces gave up five rebels captured in the course of fighting, according to officials from both sides. The Ukrainian side also handed over a senior Orthodox monk from Donetsk. He was detained at a checkpoint in August for allegedly collaborating with the separatists. "Negotiations for the exchange were difficult," the DPR human rights ombudswoman Daria Morozova told reporters. Morozova underlined that it is impossible for the sides to exchange all their prisoners, although this is one of the measures required by the Ukraine peace agreement reached in Minsk last year. Kiev is still seeking the release of 134 people in captivity, said lawmaker Iryna Herashchenko, one of Ukraine's envoys in Minsk. "Today after an almost four-month pause, the process of liberating hostages finally started," she wrote on Facebook. More than 9,200 people have been killed and 20,000 injured since the revolt against Ukraine's new pro-Western leadership erupted in April 2014, according to the United Nations. Kiev and the West accuse Russia of supporting the insurgents and sending regular troops across the border, claims that Moscow denies.